Light Fantastic Pinxton Community Clear up 8th April 2010. The day was designed to encourage local community involvement and many of the activities particularly involved child participation. The beautiful weather increased the number of children happy to participate in outdoor activities and many were keen to use the Energy Bike and Carbon Countdown game. There were also several parents of young children and retired people who were able to collect free low energy bulbs from us. Many people were keen to know more about LED’s & spot lights, more attractive bulb shapes and safe disposal. See Joanne Rawson for photos. This was a busy sunny day in South Derbyshire at the Rosliston Forestry Centre. 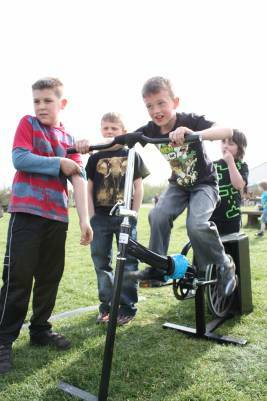 There were lots of activities for children and we were inundated with requests to use the energy bike. At one point there was a crowd of twenty children all waiting and competing on the bike to see who could light up the six low energy light bulbs. We even got caught up in a debate with a nine year old boy about what was better for the environment, watching TV or making paper aeroplanes. There was lots of interest in the alternative bulbs that are now available and plenty of willingness to change over remaining non low energy bulbs. We spent a lot of time also discussing the most appropriate renewable technologies for homes in the area – there seems to be a great deal of interest especially in solar photovoltaics. One in depth discussion revealed that a family were spending £115 per week on LPG to heat their home. Suitable alternatives such as heat from wood or solar hot water were discussed and installers recommended. We also had interest in insulation for homes. Five families signed up straight away and another four took contact details for the future. Eight attendess, one was from Warm Front, the other seven from the LAs. Attendees very happy with it. Left them all with a handout they can keep on their desk for when they get enquries from the public - they all liked this. We did an activity where they thought of questions the public might ask them and practised answering them in pairs then fed back to the whole group. Also, added in a short presentation about planning permission, grants and feed-in tarrifs. We began the session by getting them to write down question the public had or might ask them on post-its. At the end they all felt that they could now answer those questions. This was one of about 20 stalls at a Greening Campaign launch in West Bridgeford. Overall event was very busy. Did nine footprints over the three hours of the event. We took the lightbulb library along and this proved popular with lots of questions about halogens and LEDs: spoke with 30 or so people. For 12 officers at Gedling BC, most of them from Planning. They found the activity around how to install renewables in different areas of a borough useful.